I am so digging this. Bright and brilliant and an amazing contrast to the previous six covers. This one screams, how do I say this... "Here I am, at last. Here is where I make my final stand. No matter what happens, I will hold my head high and proud. Now do your worst." 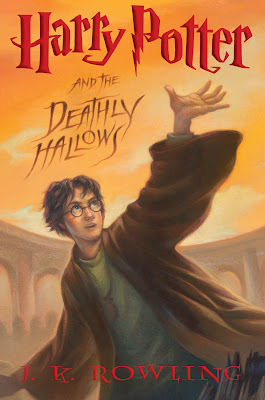 Harry Potter and the Deathly Hallows comes out on July 21, 2007. EDIT 5:53 PM EST: I keep looking at this cover and for some reason I can't help but think: Harry is gonna die. There's something about this cover that hints at at, just like the last cover seemed (well it did for me at the time anyway) to be hinting at something major. It's the heavenly glow of the whole piece, it has a welcoming warmth to it. Wouldn't it be something if Harry is killed, and we then see him come to Heaven and finally meet his parents and everyone else that he has lost?